The National Institutes of Health Advisory Committee to the Director (ACD) today presented to NIH Director Francis S. Collins, M.D., Ph.D., a detailed design framework for building a national research participant group, called a cohort, of 1 million or more Americans to expand our knowledge and practice of precision medicine. Dr. Collins embraced the design recommendations made by the ACD, noting the need to remain nimble and adaptable as the Initiative progresses. He also thanked the Committee for their recommendations on policy issues and welcomed the opportunity to review them. NIH plans to move quickly to build the infrastructure so that participants can begin enrolling in the cohort in 2016, with a goal of enrolling at least 1 million participants in three to four years. “We have an incredible opportunity to advance research and make new medical breakthroughs through precision medicine, which tailors disease prevention and treatment to individuals based on genetics, environment and lifestyle,” said Department of Health and Human Services Secretary Sylvia M. Burwell. In order to advance this approach to medicine, President Obama proposed the Precision Medicine Initiative, which aims to enable a new era of medicine through research, technology and policies that empower patients, researchers and providers to work together toward development of individualized care. The Initiative includes many components with efforts from across the federal government and was budgeted at $215 million in fiscal year 2016 by the President. NIH will lead efforts in cancer genomics, as well as the development of the participant cohort. Of the total proposed in FY16, $130 million was allocated to NIH to build the research cohort. create a platform to enable trials of targeted therapies. The report also proposes an innovative strategy to allow any person living in the United States to voluntarily enroll in the study directly or through participating healthcare provider organizations. Participants would volunteer to share core data including their electronic health records, health survey information and mobile health data on lifestyle habits and environmental exposures. They would also undergo a standard baseline exam for vital signs, medication assessment and past medical history and provide a blood sample. In return, participants will have access to their study results, along with aggregated results from all study participants, and will be provided with tools to make sense of the results. All of this will be accomplished with essential privacy and security safeguards. 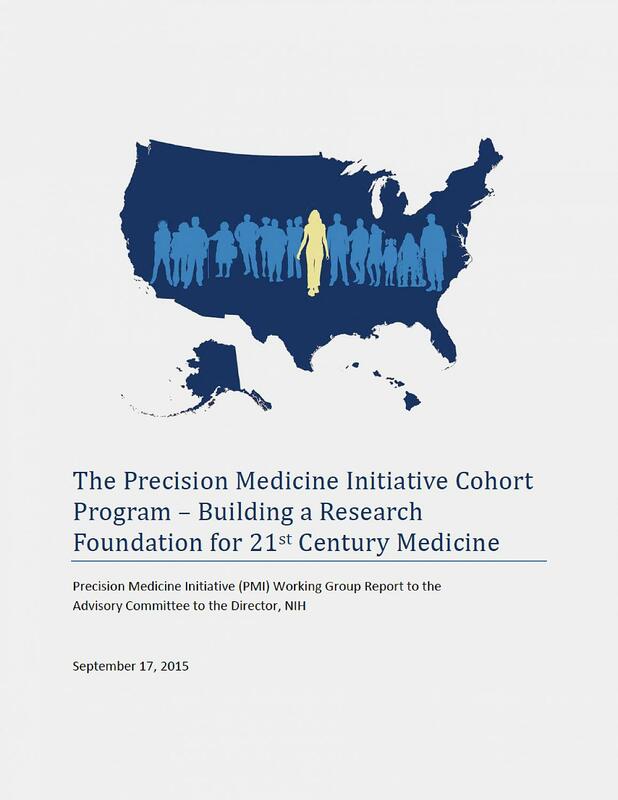 The Precision Medicine Initiative cohort would be a highly interactive research model with participants as partners in the development and implementation of the research and with significant representation in governance and oversight. The report also recommends that NIH appoint a director of the program with institutional authority, professional expertise and structural support to lead the effort. NIH agrees that such leadership will be instrumental to the success of the study and will immediately launch a vigorous national search for a candidate. NIH has appointed Josephine P. Briggs, M.D., as the interim director of the NIH Precision Medicine Initiative Cohort Program. Dr. Briggs, a nephrologist, is the director of the National Center for Complementary and Integrative Health. Her own research has focused on mechanisms of diabetic kidney disease. She brings extensive experience in oversight of clinical research to interim leadership of this program. “I want to commend the Precision Medicine Initiative Working Group. They worked at unprecedented speed with an incredible amount of passion to deliver an excellent plan,” said Dr. Collins. There are many components of the President’s Precision Medicine Initiative and many federal partners, including the U.S. Food and Drug Administration and the HHS Office of the National Coordinator of Health Information Technology. The ACD advises the NIH Director on policy matters important to the NIH mission of conducting and supporting biomedical and behavioral research, research training, and translating research results for the public. The Office of the Director, the central office at NIH, is responsible for setting policy for NIH, which includes 27 Institutes and Centers. This involves planning, managing, and coordinating the programs and activities of all NIH components. The Office of the Director also includes program offices which are responsible for stimulating specific areas of research throughout NIH. Additional information is available at http://www.nih.gov/institutes-nih/nih-office-director.